I made a small tweak to the categories I recently created. The Media category seemed a little vague, so I moved all of the articles that are thematic links to other parts of the web to their own page, which I have called Web Wonders. In other exciting news (?) I have changed my profile picture. This is a shadow of my former self taken 10 June 2005. 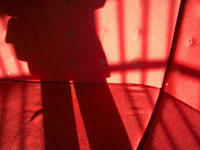 I enjoy taking photos of my shadow, especially when I can find a distinctive texture or colour as a background.